It came to me that a lot of people post a quick idea of theirs on the suggestion forum, get negative replies, and then never visit the forum again. The truth of the matter is that that forum’s a very serious discussion on implementing new features into the game. Imagine it like a board meeting for a company- saying a random thought won’t get you much support. A good suggestion, while fun, take days to create- time most of the community can’t afford. I think that’s why lots of people prevalent here avoid that sub forum. While the seriousness does provide better feedback, I feel that it allows prevents a lot of great concepts off the drawing board. The small suggestions thread is rarely reviewed, so it doesn’t help much. There’s so many people here, it’s a shame we don’t all have the time to post detailed suggestions. With that in mind, I’d like to introduce this thread. Collaborative Suggesting, is as its name suggests- a suggestion created by the entire Minecraft community. I will help by making sure the thread’s on track and updating the OP, but the rest is up to the community. We’re all creating this together, so we all have an equal say. You can chime in by adding some feedback, posting a little idea of yours, or could recurring post your thoughts and options. I don’t know how popular this’ll be, but hopefully it sticks. It has the potential to become a very cool thread. To the start off, I thought we’d go with the most creative option available- building a new dimension from the ground up. Dimensions have so many possibilities- world generation, relationship with other dimensions, and the inhabitants of the world; to name a few. If you have any ideas for a new block, item, mob, structure, boss, anything- please post it. It doesn’t have to follow the suggestion forum rules, so it can be a vague wishlist for all I care. Just make sure you give a basic description so we know what you’re talking about, and it should be related to the dimension. I think if hundreds of people start pitching in little ideas of theirs, we’ll have enough to create a new dimension three times over. This can be a place where everyone can work together, from experienced suggestors to everyday posters to new members. I first went onto this forum over two years ago, in August 2015. Ever since then I’ve always been drawn to this forum. It was only until a month and a half ago when I had to courage to finally create an account and start sharing my ideas with the world. If you’re reading this as someone who hasn’t made an account yet, I highly advise that you join the forum. It’s a thousand times more fun to be part of the community than just watching it. This thread is a great place to start out. All you need is a tiny spark to contribute. Even if you don’t have an idea, you can provide feedback on others and help make this a reality. I don’t want there too much rules, as this is more of a casual discussion between friends rather than a professional evaluation of a new feature (the suggestions forum). Still, everything needs at least some basic rules. It must be related to the topic. This isn’t a carefree version of the suggestion forum, we’re working on a single large idea (the new dimension). Make sure that any ideas you have are related to the dimension. If you have an idea that doesn’t have to do with the dimension, consider posting it on the Small Suggestions Thread, or post it as its own thread in the suggestion forum (read the suggestion guide though). You could feasibly add something to another dimension, but make sure its closely related to the dimension (ex: Enderman in the Overworld). Provide at least some small description. In a perect world, everyone would be detailed and precise about their ideas. But I understand that some people don’t have the time to put so much effort in one small idea. All I need is a basic description of what the idea would look like and do. Though if you do have time, add as much detail as you can to increase the chance of upvotes. I am not in charge. If you see an idea that you like and think it should be added to the dimension, upvote it. That way I can tell what the community wants in the final product (remember, this is collaborative, I shouldn’t be deciding anything by myself). In the event of a larger disagreement, I’ll post a quick poll. Keep it friendly. As I said before, the suggestion forum is like a business meeting. Everyone is very serious. Imagine this thread as the lunch break- if you dislike an idea, just say “I don’t think that’s a good idea, because ______” and be done with it in one simple sentence. No need to throw around support and no support either. No Aether. It’s been done over and over again. I would strongly recommend we come up with something more original. Have Fun. At first I wasn’t going to add this because it felt cheesy, but I do think it’s important to note that this is a carefree environment. This isn’t life or death. If you disagree with what the majority rules, don’t complain. As usual, all forum rules still apply. I don’t want to post my ideas for this yet, as I don’t want to take over the thread. Remember that there are some questions to keep in mind as we begin. The first thing we need to figure out is the overall “feel” to the dimension. The Nether is “hell”, and the End is either “space”, “corruption”, or “heaven”. So what will the fourth dimension be? I’d advise it to not be related to the Nether or End, and take a new theme we haven’t seen before. Beyond that, we also need a catchy yet original name, and a way to get to the dimension. If you have any other ideas not related to those three topics, feel free to post; but remember that for now we really need to figure out those three questions first. Well, this certainly looks interesting. If the idea takes off perhaps this kind of thread can be used to help new users get their feet wet. As for the dimension, I've got two ideas for a theme. Cyber/futuristic: This dimension is technologically advanced, but also very hostile. The player would deal with robots, or perhaps some kind of alien, and would be able to get more advanced materials here, which could perhaps be used to make machinery of some kind. It would act as a gateway to more post-End content. Steampunk: This is essentially the Cyber idea but more closely fits Minecraft's context. The dimension is a giant mechanical city sprawling infinitely on the horizontal axes. I imagine that this place would be full of roaming automatons. This would be more of a mid-to-end-game content dimension, where the player isn't expected to defeat the Ender Dragon first. A steampunk themed dimension certainty would be interesting. It'd would a new environment we haven't seen before. I would suggest if we went through with this, it'd be entirely populated by robots and machines, bringing up the question where did all the living things go. Likewise, a more combat-based dimension already provides a use in game- late game XP grinding. Post-ender dragon players could go here to fight even more powerful enemies, which in turn would provide more XP for more powerful weapons. If we went with a post-end dimension, the whole progression system needs to be rethought. There gets to a point when players need to upgrade past multi-enchanted diamond swords/tools. But if that happened, the weapons would be ridiculously OP and server PVP would be ruined. I can think of multiple ways around this, but they all have serious disadvantages that make the new weapons underpowered. All in all though I like the idea of a steampunk (with a hint of cyberpunk) based combat focused dimension that might serve as a late game "arcade" for those who wants some extra buffs. I could imagine an entire dimension that's effectively a huge dungeon. I think this dimension should have a unique transit system. The nether has buildable portals, and the end has a naturally spawning portal. For this dimension, how about an item, not a portal, can take one in and out of the world? You would have to be away from any mobs (similar to sleeping in beds) for this to work though. The item could naturally spawn in chests inside a new structure in the End, or could be craftable using late-game materials. How about, since this is a steampunk dimension, a train? Once you've obtained dragon breath you can use it on a minecart with furnace. The furnace will burn brightly, and then it will shoot forward pushing any minecarts ahead of it with it, including any players or mobs within. After about maybe 50 blocks, the train will be teleported to a safe location in the new dimension. This can be repeated to go between dimensions, and you can find dragon breath in some chests in the new dimension (so you don't become stuck). However, as you explore the dimension, you can find materials to build a Hyperspeed Engine that can be used to build a minecart that can swap between dimensions at will and doesn't require fuel or track (however it cannot be used for travel within the dimensions). Since we're on the steampunk theme now, how about we reintroduce gears? They could be vertical redstone. And since steampunk is a very manmade theme, there should also be a lot of varied generated structures. Chimneys that emit blinding smoke, elaborate redstone traps, etc. EDIT: How about rather than a traditional dimension, it's one giant procedural structure? It would really fit the dimension well. And perhaps you can't break blocks already there until you do a special task. E.g. I had a Mansion Dimension idea where you had to kill a special Illager before you could break what was there. Alternatively, the player could build armored walking mechs, which might fit better with the steampunk style. Would we have to introduce new ores into this dimension? I'm thinking copper or zinc could be used to make brass, which would then be used for steampunk things like the mech suits or vehicles. Something else to consider with a new dimension is the color scheme. This may sound silly, but here me out. The Nether has a color scheme of crimson red, and orange/yellow. The End has a color scheme of black, purple, and bright yellow (endstone). So, what would the color scheme of the new dimension be? Personally, I would really like it if one of the main colors was green, though if it were steampunk it would probably have to include gray/grey or brown too. If we went with a post-end dimension, the whole progression system needs to be rethought. Fishg, you are 10000000000000% right on that. Adding more end-game content at the moment would already be pushing it, as you can get fully-enchanted diamond armor so early on compared to how far away the elytra is. I think we should preserve the Diamond Armor, and the enchanting too, but we need to space it out more and maybe make different "tiers" of diamond armor. What do I mean by that? Well, first we should start by making it so that the player doesn't get full iron armor the first or second night. It's kind of silly how easy it is to get; it gets to the point where the default player is with the armor points of full iron armor, since it is so easy and to obtain. My proposal is that we make either iron ore smelt into 3-4 iron nuggets, or we make iron gear require more iron to make. Maybe iron ore that smelts into ingots could be found deeper, too, so that if you're already at the point of iron armor you can easily get more of it in case you want to make hoppers, cauldrons, anvils, etc. Now for how we could add "tiers" of diamond armor. The concept as already been partially implemented with having different levels of enchantments (Protection I, II, III, & IV), but just like getting leather and getting iron, they aren't really spaced out. We could potentially make it so that the player has to start out using just Protection I, and then has to get new items to use in place of lapis in order to get higher versions of enchantments. Another Idea for a Dimension! Anyway, I am really excited for the thread. I can't wait to see the amazing ideas we come up with, and maybe even get put in the game! Fishg, you are 10000000000000% right on that. Adding more end-game content at the moment would already be pushing it, as you can get fully-enchanted diamond armor so early on compared to how far away the elytra is. In Terraria, for those who don't know, you slowly progress through the start of the game in a sort of "Easy Mode". Once you defeat a difficult boss (The Wall of Flesh) you can move on to a new mode, the unsurprisingly named "Hard Mode". In which, evil biomes spread across the landscape, requiring you to contain them, harder enemies spawn, and you can do more exciting stuff. But the reason for me bringing up Hard Mode or Progressive Difficulty in the first place, is that if we want to add a new dimension with end-game stuff, we need something to give good reason for this new stuff. The one good reason many Gun threads get turned down is because the Bow is already capable of doing significant damage, and in order to make the gun powerful enough to make it worth using, it has to be incredibly overpowered. The same thing can be said about vehicles (or most modern objects), ridable dragons, and many more things. If we're adding more end-game content, then we need to add more end-game threats. The thing about Minecraft is that the difficulty kinda stays the same. (I think there may be regional difficulty or something like that, but I don't know a lot about it. We should be able to bypass this problem with the new dimension. Since players have the choice of when to enter it, we don't have to worry about early game players getting destroyed by very dangerous mobs. We can assume that everyone coming to this dimension has enchanted diamond. An example of this is the Divine RPG mod, which has 5 dimensions that progressively get harder and require you going to the previous dimension first. I'm not saying we need 5 dimensions, but this sort of "new dimension = more difficulty" idea would work well here. What do I mean by that? Well, first we should start by making it so that the player doesn't get full iron armor the first or second night. It's kind of silly how easy it is to get; it gets to the point where the default player is with the armor points of full iron armor, since it is so easy and to obtain. My proposal is that we make either iron ore smelt into 3-4 iron nuggets, or we make iron gear require more iron to make. Maybe iron ore that smelts into ingots could be found deeper, too, so that if you're already at the point of iron armor you can easily get more of it in case you want to make hoppers, cauldrons, anvils, etc. I completely agree that the current system is a bit too simple. While I'm open to a such a game-changing overhaul to the Overworld, I believe there may be a far easier alternative. Going off the idea that this dimension will contain harder mobs, how about we simply add another armor set obtainable from this dimension. Say the "zombie" of this dimension is 4x as powerful. Enchanted diamond would be the equivalent of iron here. We could take advantage of a possible steampunk theme by changing this dimension's progression to be more about building "gadgets", rather than smelting materials found from caves. You'd have the scavenge through the dimension to gain parts, and then put them together to create new "gadgets", such as crossbows, booster boots, or x-ray goggles. It might sound moddy, but I think with some effort and the vanilla game intended it could work. The only foreseeable problem with this is that even more powerful weapons would make the Overworld a joke. However, if the player has already defeated the End they already are very powerful, and as long as Overworld materials (such as diamonds) aren't required in the new recipes, mining in the Overworld will become useless. I think it would be neat for the Overworld to transition through the game into a "peaceful" biome, with most of gathering and combat taking place in the other three dimensions. When I first read this I really liked this, but the more I think about this the more my doubt grows. If this only attained thorough failure, will it come across annoying rather than exciting? It seems just like another tedious step. Also, just how much would be in the dimension? If there's a lot of cool stuff going on in here, will players purposefully die just to enter the Eternal Seas? Still, I wouldn't be against this being our final product. The only foreseeable problem with this is that even more powerful weapons would make the Overworld a joke. That's my reasoning for bringing up Progressive Difficulty or a Hard Mode. The Overworld is going to slowly become less and less threatening, and by the time you get the super-endgame stuff, Overworld mobs are just a slight inconvenience. I think it would be neat for the Overworld to transition through the game into a "peaceful" biome, with most of gathering and combat taking place in the other three dimensions. Eh... I'm not really sure about this. The Overworld is going to be the main place where the player is constructing buildings, mining ores and farming animals, and I think that the Overworld should still require some amount of effort to survive in. Hostile mobs are what make mining trips underground more dangerous than simply clicking away at stone and watching out for lava, and when the player has super-armor that nullifies mob attacks, that fun is kinda taken away. I like this idea! What if the new mobs in the dimension weren't hard in the "extra damage" or "extra health" sense, but rather were hard based on something they could do, similar to how part of what makes the enderman hard is its ability to teleport. This would make "gadgets" very relevant, and add more interest to the game's mechanics than the current system. Honestly, I still want the Overworld to have challenge. At the moment, it doesn't (or at least with enchanted diamond armor + diamond sword), but I would really like it to. This doesn't mean it has to be extremely difficult, as a player who is seeking a challenging adventure would go to the new dimension, but I still think there should be at least some level of challenge to walking around at night in the Overworld. 1. There would probably be a legitimate way to get to the "Eternal Sea" dimension; it's just that failure of the player would result in going to this dimension unprepared, which would therefore make it even more challenging. 2. As for content, I was thinking it could be like an "Undead Sea"; having ghostly versions of past sailors and maybe even marine life. If you'd like me to make a proof-of-concept suggestion for this, please let me know. 3. There would of course be a method of exiting the dimension, though I haven't fleshed out this part of the idea yet. Actually, that one could be made to deliberately involve getting in the "Eternal Sea" by Hopeless Boss Fight, in that it consists of a near-unwinnable boss that is intended to send the Player there, with the boss dying if the Player escapes the dimension. That is actually really interesting. I think we should generate some more dimension ideas before we decide on one now, though, even if we end up picking the steampunk dimension. We should probably set a goal- maybe have a dimension picked by the end of this week or the end of next week? I don't know, but I think this thread could easily get unproductive and/or die if we don't set goals for ourselves. Dream Dimension. Where players go when they're asleep. This would allow multiplayer sleeping to work. There's a lot of ways to pull this off, but the best way imo is to make it 100% random- like a real dream. A player might go to sleep one day and find themselves in a very realistic dream world where they could fly alongside white horses, and the next in a giant purple cave where evil bunnies are chasing you. Each person would be in their own separate dream. You would probably be able to leave at will, and what you do in dreams would have no effect on gameplay (except for maybe a few key things). Limbo Dimension. I started writing a suggestion for this a couple weeks back, but I lost interest. It'd be a empty superflat world entirely white. The sky, ground, everything. It looks a lot like where Harry goes in Deathly Hallows to learn about his purpose. No mobs would spawn here, nor can you build here. Every now and then white versions of overworld structures would spawn in the locations relative to their location in the overworld. So a desert temple at the overworld origin would spawn in white blocks at the limbo origin. The main purpose here would be finding structures faster- without any mountains or trees in your way. You could enter this dimension at well via a magic item, perhaps a ring (lotr reference). However whenever you come back you return to your location you left in, to prevent OP transit. I feel that we're most likely gonna use the steampunk dimension (my vote so far is going for that, even if I'd really like to see the other three), maybe this "unwinnable boss" was in the steampunk dimension? That way, we can give an excuse to make "the eternal seas" as a subdimension to the main one. Though it would probably not be a sea. I am an ux designer who works for an android app development and usability testing company. three), maybe this "unwinnable boss" was in the steampunk dimension? subdimension to the main one. Though it would probably not be a sea. The only problem with the steampunk dimension is that it's so far out there we might not be listened to. A lot of people would argue it is unconnected and unfitting with the Minecraft universe. So, in other words, how are we going to "connect" (not literally with a portal, but lore wise) this dimensions with the rest of Minecraft? The same way the rest of the game is: Barely at all. For starters, Ocean Monuments are just... there, and so are Dungeons. In fact, I'd say that it should be made so that it being "just there" is the entire point of it, as a way to "go back" to when the game's lore was basically "You spawn, now try to make a shelter before the first night" rather than the implications of the current structures. Of course, if NPCs existed in the 4th Dimension, then they could be made to lookmore like the Player than villagers, bridging with "Where are the other humans?" question. Plus, it could explain where jukeboxes came from. First of all, jukeboxes / music discs come from old villagers. At least, that is my assumption, since saddles come from villagers (the leatherworker). 1. How do you get to this dimension? 2. "Who" made/controls/lives in this dimension, and what is his or her relationship to other things in Minecraft? 3. How does this fit the Minecraft theme? 4. 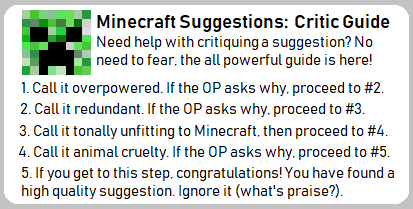 If Mojang were to use this concept, but not necessarily the specific blocks, items and mobs, would there be enough logic/lore/explanation for Mojang's ideas to be built off of our idea and still be similar? Additionally, I (and probably many others) would really not like a human mob. The player is the human mob. Before we start this part, which is very important, maybe we (and by we I not just me, wolftopia, and amppl50) should brainstorm a some more ideas. While steampunk might seem like the best idea, now, who knows? Maybe something even better is out there. Also, I vote against human mobs. Villagers already take up that role if you ask me. A dimension with the theme of ice, air, crystals, and floating islands, the color palette ranges from a dull gray-white to a bright blue, with terrain generation that almost certainly requires the use of an elytra to explore many of the areas. I have two ideas for biomes so far, Snow Spires, which is kind of like an enormous icy canyon, full of jutting spires of packed ice and snow, and the Flurry Field, a flat expanse of icy lakes and geysers of chilling air that propel you upwards, extremely high if you're using an elytra. Below a certain y-coord would be a mist effect that makes it a bit harder to see, but is mostly for looks. Above this biome would be a series of floating islands with much to find. There is no bedrock layer beneath or above the biome - there is only a chilling, misty void ready to swallow you whole. The place would rather commonly have ravines that lead down here, with cracks and holes scattered throughout the Snow Spires. Slush - Acts like gravel, but also has a chance to fall to a random direction (left, right, back, forwards) if it is able, making slopes and hills. Ice Crystal - An ore found in the Snow Spires. Mining the ore gives you the item without need for smelting, and fortune works on it as well. Geyser - Periodically fires a fast stream of icy air after a small warning that flings any entities upwards at high speeds. Can be collected with silk touch, and - if placed by a player - can be "turned off" with a right click. When turned off, you can reactivate it using redstone, or turn it back to a random periodic blast with another right click, turning it on. I don't have any idea for mobs or structures of as now, but I'll be thinking about it throughout the day and I'll add more when I'm able! While this is true, I think we should have at least some idea of the answers to the questions asked above in order for a dimension idea to be a good candidate. There needs to be at least some rationale to why a dimension would make a good and reasonable addition to the game before we spend a lot of time coming up with the specifics. Same. I think players are the human mobs; having a mob that looks like a player would feel very weird. Hm... I'll have to disagree with some of the suggestions on the dimension's basis. Having a Steampunk or Futuristic-based dimension would immediately feel out of place. A frost one sounds... For lack of a better word, lazy, since we have a dimension based around extreme heat. The original Aether for what it was did a fantastic job of adding new game elements and an environment which felt like it could fit comfortably into the vanilla game. This is the sort of stuff we've gotta shoot for. A sort of compromise of a civilization-derived dimensions could be similar to a sort of gigantic, ruined, stone city. I say this, because... Well, let's face it; Minecraft is a post apocalyptic setting. Some ancient civilization made these stone structures, (dungeons, strongholds, temples) which are fun to explore, yielding all sorts of loot, yet dangerous, with traps and mobs lurking about. All the while with a sort ominous atmosphere. It'd most likely be a high risk, high reward sort of place, probably quite dark, taking place within titanic caverns with the likes of stalactites, for example, and while sporting high amounts of ore, possibly including a new type of ore. If not that, then perhaps a sort of place featuring water? Or, a more cosmic setting? Something unique. Granted I'd argue we fix up the Nether and End and add more to them before we add another whole dimension.